Thank you for your interest in hosting an event at the Alley Theatre! Whether you are looking to have an intimate dinner with friends before a performance, a holiday party for 200, or your next shareholders’ meeting, our skilled staff and experienced caterers can help you create an event to remember. The Alley Theatre has several meeting and function rooms, and unique lobby spaces that will make your next event stand out. Please note that due to the Alley’s own production schedule and set limitations, we are unable to rent our stage spaces to outside theatrical, dance or concert events. 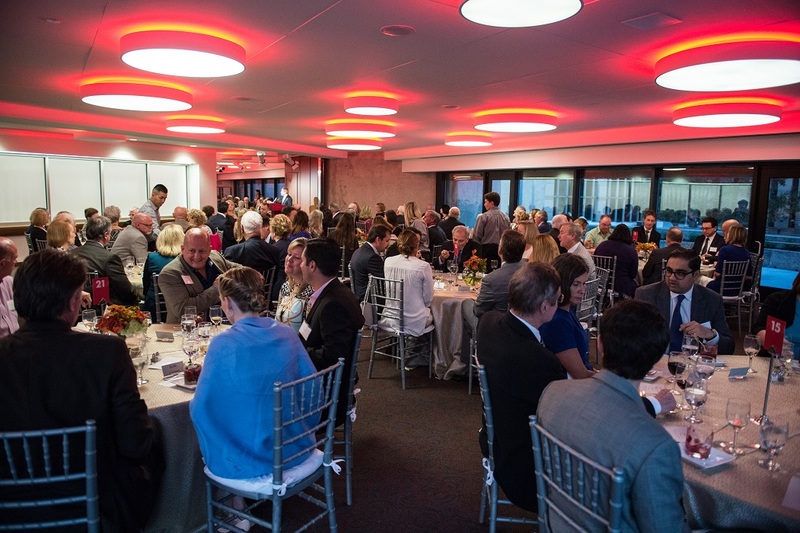 The Alley Theatre’s newly renovated Terrace Rooms—the Texas Room and the Louisiana Room, located on the fourth floor above the Long Lobby, offer elegant spaces with terraces that overlook the center of the Theatre District. You will find this the perfect spot for entertaining before or after a performance, hosting a cocktail parties or planning a wedding reception. The rooms can be used individually or joined to create one large event space. Kitchen facilities and private restrooms are conveniently located on the same level. The Gallery, located just outside the Hubbard Theatre entrance, offers a intimate reception space for pre– or post-show dinners or a quick intermission reception. The 14th Floor Board Room boasts the best view of the theatre district from its majestic balcony high above the main theatre building. Kitchen facilities and private restrooms are conveniently located near the room. Four elevators provide easy access from street or tunnel levels to the 14th floor. Perfect for your next meeting with a built-in projector screen and conference phone. WiFi available. The Long Lobby is a multi-level indoor reception area bordered by elegant terraces overlooking downtown Houston. This facility includes three carpeted reception areas, two built-in bars, two terraces, and accessible restrooms located on the main lobby level. Two elevators provide easy access from street or tunnel levels to the primary lobby on level three. The Mitchell Lobby, just outside the Neuhaus Stage and connected to the underground tunnel system and accessible via stairs or elevator, is convenient for patrons using the Alley Theatre parking garage or the Theatre District parking garage. There is one built-in bar. Restrooms are available on this level. WiFi available.